When you’ve built hundreds of custom homes, you dream about features you want to incorporate in your own vacation home, too. Such was the case for Dawn and Greg Shaw, who own Stoughton-based Shaw Building and Design. 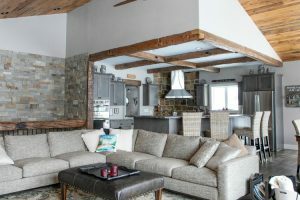 The couple had been visiting friends in the area for about 11 years, and in 2014 they decided to pull the trigger and build their own second home. Fittingly, the abode is also a great meeting spot for clients interested in building their own Northwoods properties. “The home is built on the top of a slope, and we knew we wanted a walk-out basement. The five acres give quite a bit of privacy, and it’s a smaller lake, so there’s a lot less traffic and use of the lake,” says Greg. In fact, Little Presque Isle Lake only has nine homes on it—the closest neighbor is about a lot and a half away—so it’s truly a private getaway. Being that the couple are builders, they were quite strategic in not only how they concepted and designed the home from the floorplan to the materials used, but also in the home’s inviting feel. For them, the home is a reflection—literally—of their work and family life, so it was vital that their happy house had a heart. On the main floor is the great room with cathedral, 18-foot ceilings, adjoining kitchen, master bedroom and bathroom, and a powder room. By design, this area can accommodate the couple’s large family with ease—a recent gathering saw the home hosting 13 adults, a grandchild and six dogs. The home has a nice balance of natural woods throughout the entire great room’s walls and ceiling, and touches of drywall on some of the walls. 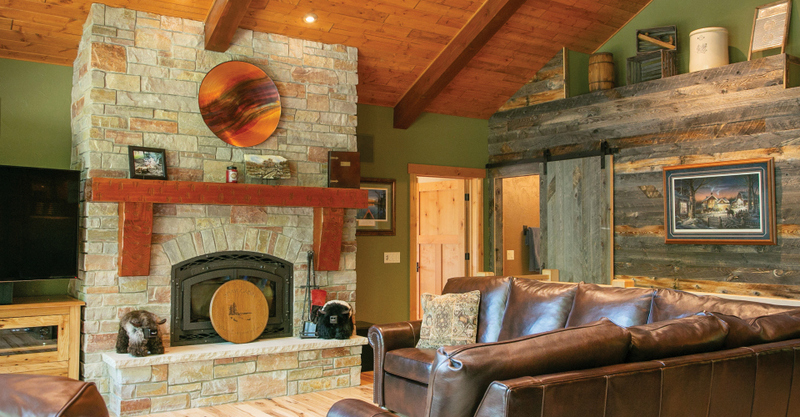 The mix of materials imparts a bit of a modern feel versus an older, cedar cabin feel. “[This is] the best of both worlds,” says Dawn. 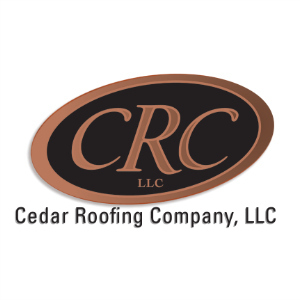 A smattering of wood species such as pines and cherry are used in the home’s ceilings, and hickory flooring is throughout. A few walls and a door also use reclaimed barn wood. The kitchen features handmade wormhole cherry cabinets, which gives them a rustic finesse. The Amish-crafted cabinets were finished with a black spray around the edges to give them a unique look. The couple chose to pepper in some glass-front cabinets inlaid with seeded glass, which lends a vintage feel. Lights on the top and bottom of the cabinets illuminate what a custom kitchen feels like, adding happy mood lighting for family gatherings and food preparation. Dawn also chose a light stacked-stone backsplash, leathered granite countertops and a polished granite island top from Nonn’s Kitchen Bath & Flooring in Madison. The distressed black island base punctuates the room for a splash of modernity. On display on top of the cabinets is art the couple has collected from their world travels, which reinforces their personal touches in the space. The couple’s art is also sprinkled throughout the entire main floor—including a copper dish above the fireplace by a Minnesota artist and two small Scottish Highland cows on either side of the fireplace. Adjacent to the kitchen is a traditional dining table with Mission-style chairs and a cool Persian-inspired rug from Madison-based Sergenian’s Floor Coverings. The rug is a nice counterpoint of bohemian style mixed with warm, classic furniture. The round, wrought-iron light fixtures above the dining room table are from Madison Lighting—and the shape is one Dawn chose to employ throughout the home. “The wagon wheel over the fireplace in the sunroom gave me the theme of round, so I used that round shape in a lot of light fixtures throughout the house,” she says. That welcoming feel extends to the sunroom, the couple’s favorite room in the house. It has an indoor/outdoor look to it with tiled floor, cozy furnishings and fireplace. The large wagon wheel above the fireplace Dawn refers to was a find from a shop in Boulder Junction. The family frequently hangs in this room to catch lake views or play games and cards. It’s the perfect space for the Shaw’s kids, their spouses and their kids’ friends to connect in—who also use the home frequently, too. When the weather’s great, the screened-in porch is another ideal hangout spot with rattan-look furniture, a barn wood accent wall and a colorful woven hammock hanging against the reclaimed barn wood accent wall was picked up by the couple in Colombia while visiting their daughter. A large deck outside the screened-in porch extends the entire length of the home, and the deck railings are outfitted with steel cable to maintain an unobstructed lake view. The Shaws are happy with the look of the home, but most importantly, they appreciate the design of it. That comfort is what brings the couple back here almost every other weekend, on holidays, and longer, 10-day stretches about four times a year. When the couple was constructing their home, they spent quite a bit of time eating out and exploring the area. Dawn shares some of their favorite haunts in the Boulder Junction area.